This photo of the star-forming region NGC 1763 was created with data from the Hubble Space Telescope archive by Josh Lake. 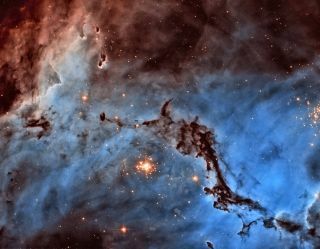 Lake won first prize in the image processing category in the 2012 contest to unearth Hubble's hidden treasures. Swirling galaxies, glowing nebulas and shimmering stars: these are the winners in a public contest to unearth beautiful images from the horde of unprocessed data collected by the Hubble Space Telescope. The gorgeous pictures many of us associate with the Hubble Space Telescope don't come fully formed as we see them. In fact, the famous photos are the product of significant work on the part of scientists who sort through, process and transform the raw data into photogenic form. But Hubble collects so much data that researchers can only process a certain amount of it into aesthetic beauty. The rest is used for scientific study, but remains visually lackluster. In an effort to harvest some of these unsung gems, NASA and the European Space Agency, which run the telescope, invited the public to pore through the archive of more than a million pictures taken by Hubble and transform the images themselves. More than 3,000 entries poured in under two categories: processed images, as well as unprocessed photos that were nonetheless beautiful but had been left hidden in the collection. The top winner for image processing wasJosh Lake, who created a gorgeous image of the star-forming region NGC 1763 in the nearby Large Magellanic Cloud dwarf galaxy. Hubble had observed this area in different bands, separating out the light from glowing hydrogen and nitrogen. Although these two gases would both appear reddish to the human eye, Lake colored one blue and the other red to highlight the contrast between the two elements and reveal the underlying structure of the region. Lake's image, which won both the jury's vote and the public vote, was awarded an Apple iPad as well as various other prizes, including a book, DVD, poster, and an autographed photo of an astronaut who'd visited Hubble. The winner in the image search category was Brian Campbell, who uncovered an unprocessed, yet striking, photo of the barred spiral galaxy NGC 6300. The swirling bright light of the galaxy glimmers against a background of stars with dark blotches of dust creating interesting patterns in the light. Campbell was awarded an iPod Touch, as well as a poster, wall print, book and DVD. The Hubble Space Telescope has been snapping photos of the universe since its launch in April 1990. The orbiting space observatory is a joint mission by NASA and the European Space Agency.